Plans to bring Altocloud’s machine learning and predictive analytics capabilities into its PureEngage platform in next several months. Genesys announced today that it has completed the acquisition of privately-held Altocloud Ltd., a cloud-based customer journey analytics provider founded and led by CEO Barry O'Sullivan. As is typical in deals between privately-held companies, financial details were not disclosed. In a phone briefing on the acquisition, the two companies shared that Altocloud has 26 employees and about 50 customers. Genesys chief product officer Peter Graf stated during the briefing that Altocloud was being acquired "for its talent and revenue in the future." Altocloud is headquartered in Galway, Ireland, with a small U.S. presence in Mountain View, Calif. (not far from the Genesys office in Daly City). As noted in a recent Altocloud blog, Galway is a hub for customer experience technology. It is home to offices of contact center leaders such as Avaya, Cisco, and Aspect, and customer experience startups like ChatSpace, joulica, and WebText. Altocloud will be very familiar to regular readers of No Jitter. From its launch at Enterprise Connect in 2014, to its inclusion in the Innovation Showcase at Enterprise Connect 2015, to Altocloud technology deployment in Five9's Summer Release 2016, there has been a regular cadence of news about the company. 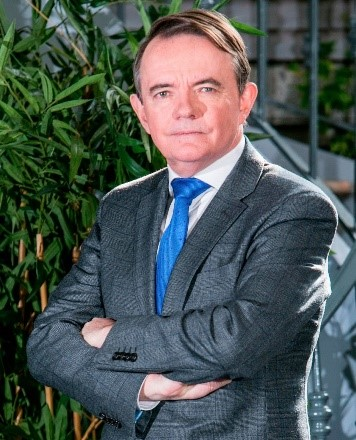 O'Sullivan is also familiar to most readers of No Jitter, initially as the head of the Cisco Collaboration business unit until February 2014. Fewer may appreciate O'Sullivan's deep contact center roots: In 2002 when he left Nortel, he was the general manager of the contact center business and initially joined Cisco in the same capacity. Going forward, O'Sullivan will serve in a role as strategic advisor to Genesys CEO Paul Segre. 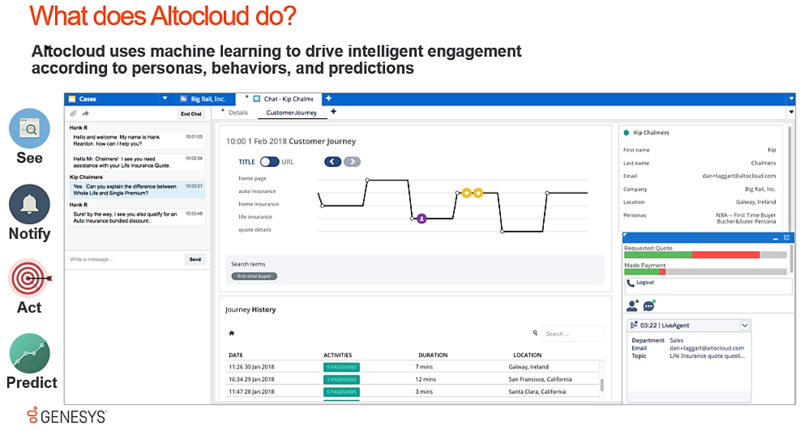 The graphic below highlights graphically how Altocloud's machine learning and predictive functionality is delivered in an easily visible and digestible fashion to an agent desktop today. When asked, Graf said that Genesys will be integrating Altocloud with its PureEngage platform first, followed by the PureCloud and PureConnect platforms. Genesys expects to start offering Altocloud-delivered capabilities to customers in the second half of 2018. The Altocloud product is solving real customer problems today with existing customers, delivering amazing ROIs. The results that Altocloud has been achieving are not just in customer service but in marketing and sales as well, areas into which Genesys is actively looking to expand. O'Sullivan shared that 80% of Altocloud's existing customers are supporting a marketing use case and 20% customer service. Altocloud's technology complements work already underway at Genesys. Altocloud's "predictive abilities are super-strong," said Graf, and its ability to gather more types of data into predictive algorithms can be combined with the AI-enhanced predictive routing Genesys is delivering to customers. The acquisition will accelerate Genesys's move into artificial intelligence. "Customer journey mapping and analytics is so important, and Altocloud will really help us round out that entire portfolio," said Graf. I asked Genesys how Altocloud fits into its AI vision of Kate, launched in October at the company's CX17 event. CMO Merijn te Booij replied, that "From an engagement perspective, Kate is about managing journeys, about augmenting the journey among customers, bots and humans. Altocloud's journey capability, and especially its proactive activity on websites, chats, and social media, is right in keeping with what Kate is bringing to the table."